A weeklong barrage of rockets on Israel's south continued early Saturday with more than 20 Qassams being fired from the Gaza Strip towards the western Negev. A man was injured in one of the blasts. According to reports in Gaza, the IAF struck a target in the Strip, east of Khan Younis. A 6-year-old boy was reported killed and three others were said to be injured. 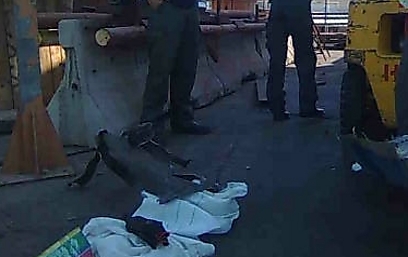 IDF officials denied the report, saying that it launched no such strike. Overnight, IAF aircraft attacked three Hamas bases in the Strip. Palestinian medical officials reported that 20 people were injured. IDF Chief of Staff Lieutenant General Benny Gantz has called a general staff meeting to assess the situation. The army attributed the latest rocket salvo to Hamas terrorists, although the militant group has so far avoided taking responsibility for the escalation. A rocket that exploded in an industrial zone in the Shaar Hanegev Regional Council injured a man in his 50s and heavily damaged a factory. The victim, who was hit by shrapnel, sustained moderate wounds and was taken to the Barzilai Medical Center in Ashkelon. An initial probe found that the shrapnel penetrated the protected area in which the victim, an employee at the facility, was hiding. According to a manager at the factory, the shelter was located 30 meters away from the blast site. "At first the worker clutched his chest because he thought he was hurt there, but we saw that he was injured in his neck," he said. "This is the third time we are hit by a Qassam, but this is the worst damage so far. The blast occurred at a critical area in the factory." Sderot Mayor David Buskila met with police and Home Front Command officials to assess the situation following the barrage. The police department in the southern city has bumped the alert level, putting all emergency services on standby. "The bombardment on Sderot is endless," one resident of the city told Ynet. "We remain in the shelters." Minister Matan Vilnai toured Sderot, Shaar Hanegev and Eshkol on Saturday, and said that "the State of Israel cannot ignore the recent developments in the south." He asserted Israel holds Hamas fully responsible for the escalation. On Friday night, the Ashkelon region came under fire, scrapping expectations of an imminent ceasefire. Three rockets exploded after 10 pm in the Hof Ashkelon and Eshkol regional councils. The IDF responded with a strike on a terrorist cell that was launching rockets in Gaza, killing one and injuring three. See all talkbacks "Rocket barrage from Gaza injures 1"